The Liberal Democrats have released a new poster which shows a Nigel Farage and Theresa May mash-up standing outside 10 Downing St. 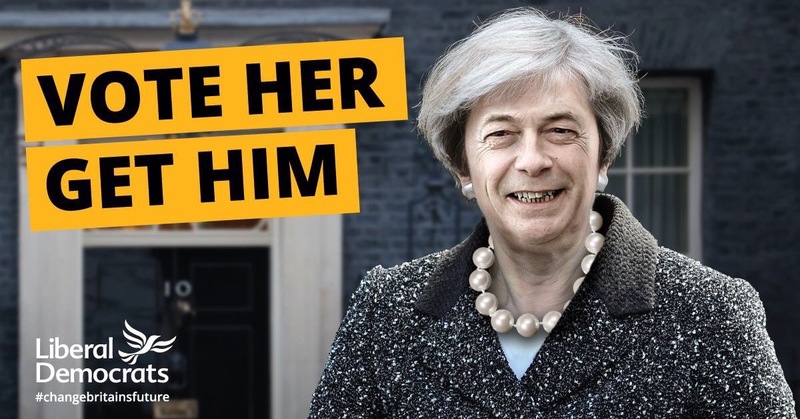 The headline reads “Vote her get him” and attempts to remind voters that, in seeking a hard Brexit, Theresa May has adopted the views and values of Nigel Farage and UKIP. This is a bit of an homage to the infamous “Be Afraid” poster Labour ran in 2001 which featured a faceswap of William Hague and Margaret Thatcher. Whilst the visual style is the same, it lacks the intellectual clarity that made the original so good. William Hague, at the time, was seen as a right-winger intent on turning the clock backwards; making him look like Margaret Thatcher was a clever way to land that point. In the May / Farage execution the message doesn’t ring true. It’s not popularly accepted that May is pursuing Farage’s agenda; people see her as implementing the will of the British public. And by voting Conservative you – taking it literally – will not be in any danger of electing Farage or putting UKIP in power. So whilst it’s an eyecatching visual – a fact that has helped it to make headlines – the message the poster is trying to deliver won’t stick as it doesn’t ring true.